The General Electric Global Research Center has been awarded a $5.9 million grant for advanced vehicle technology by the U.S. Department of Energy. 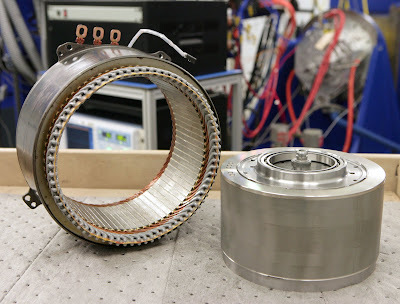 GE will provide an additional $6 million for the project, which will develop new high-performance electric motors with non-rare earth materials. The availability of rare earths has been limited as China, the major supplier, limits exports. The GE funding is part of $175 million that the Department of Energy is doling out to 40 projects in 15 states for advanced vehicle research over the next three to five years. The projects, which are expected to leverage additional investments totaling over $300 million, will target new innovations including better fuels and lubricants, lighter weight materials, longer-lasting and cheaper electric vehicle batteries, and more efficient engine technologies. As China tightens its grip on rare-earth minerals, which play a vital role in smartphones, TVs and computer hard drives, the Energy Department has been making a push to produce electric vehicles and turbines without them. The U.S. consumes about 10,000 metric tons of rare-earth materials annually, according to the U.S. Geological Survey, and increasingly relies on metals like neodymium and dysprosium for the powerful magnets used in the high-performance drive systems of electric motors and turbines. China controls 97 percent of supplies of these 17 elements. There are currently no mines for rare-earth minerals in the U.S.
Rare earth minerals have magnetic and conductive properties not found in the rest of the periodic table. Research like that being conducted at GE aims to work around limitations on supply. "This announcement is a win-win for the Capital Region and will be a shot in the arm for our clean energy economy," U.S. Sen. Charles Schumer said Wednesday. "This funding will help improve the fuel efficiency of next generation vehicles and advanced motor designs." The award will help automakers achieve recently announced fuel efficiency standards, Schumer said. Last month, President Obama announced mileage standards for cars and light trucks that will bring fuel efficiency to 54.5 miles per gallon by the 2025 model year.